This favorite handbook of doctors and patients provides methods to simplify and eating and hydration following mouth, jaw, dental or facial limitations for chewing, swallowing. This favorite handbook of doctors and patients provides methods to simplify and eating and hydration following mouth, jaw, dental or facial limitations for chewing, swallowing. It provides support following cancer treatments that can negatively affect eating patterns and weight loss as well as support for other eating aversions. 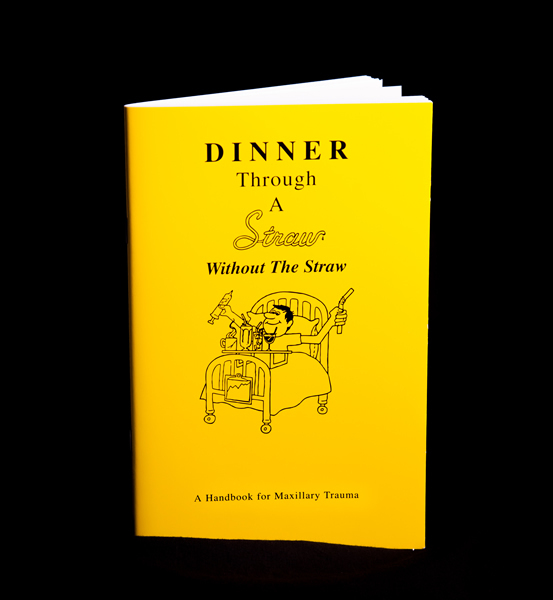 Since its introduction in 1987, the popularity of this handbook has made it the "go to" resource for patients needing eating assistance. DTAS may be the first product of its kind and has maintained up to date revisions. Other supplements have been attempted but could not replace the detailed patient support promoted throughout the book. This book of over 100 pages was originally written by a patient who only lost six pounds in her six weeks of intermaxillary fixation (teeth wired shut). Since that time, it has been reviewed and endorsed by oral and maxillofacial surgeons, dieticians, cancer management specialist and patients. It is in layman’s terms and easy to understand. Its recent revision makes it current to today’s use and widely used for many needs. Patients and families continue to rave about the support provided through the book and product line. 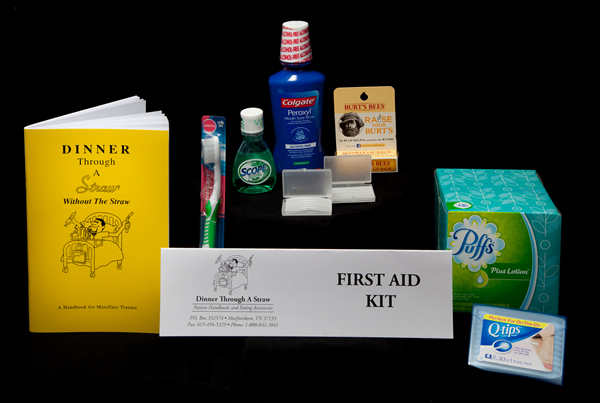 The book and products provide ideas and methods of food consumption and wellness techniques to promote patient responsibility for the healing process. By simplifying the eating process, the body maintains better nutrition and hydration and reduces complications and the emotional anxiety associated with eating limitations. Dinner Through A Straw . . .
Dinner Through A Straw discusses . . .
Simplify and ease eating and drinking. Mouth related swelling, pain, recovering from oral surgery, weakened facial muscles, dysphagia or wired jaws can make it difficult for patients to eat or drink from a cup. Zip-N-Squeeze bags work wonderfully when filled with broth, liquids, protein drinks, medication, shakes and pureed foods from the Dinner Through A Straw book. The pleated bottom of the pureed bag allows the bag to stand upright. 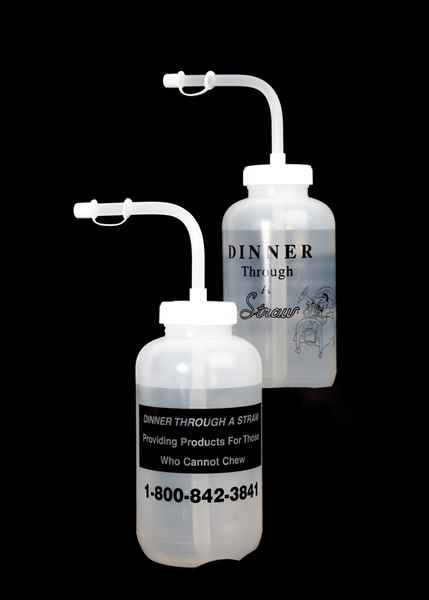 The pinch clamp prevents spills, and the patented leakproof zipper is designed to prevent rupturing when pressure is applied and food pressed through the straw into the mouth. The disposable bags are reusable for a few times and then thrown away. 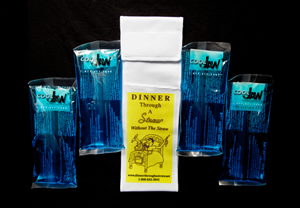 Two styles of food bags are available for food consumption. 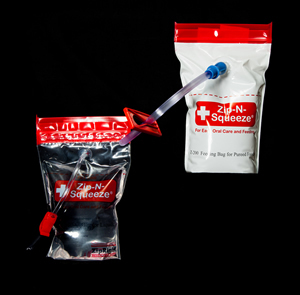 Liquid bags have more narrow tubes for clear liquids resulting in less pressure near swollen soft tissues immediately after surgery. 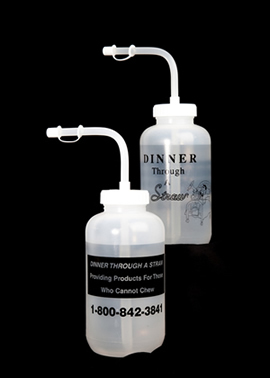 Pureed bags have 2 sizes of larger diameter flexible tubes. The difference in the bags is related to the narrow size or the larger sizes of the soft flexible attached tube. A new and improved soft squeeze bottle that is flexible to the touch. Mueller sports bottles have a longstanding reputation for their easy use and soft squeeze application. This is a sensible way of drinking food on the go, and it has been used by athletes for years for quick hydration. No sucking. 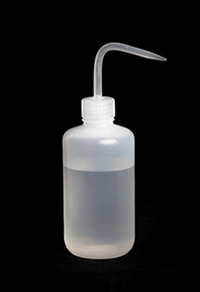 The amount of liquid dispensed is in direct proportion to the amount of pressure applied to the side of the bottle. Graphics illustrate our DTAS logo and product information. Why patients love the SOFT SQUEEZE BOTTLE. . .
Top of the stem may be cut back to increase flow. dental implants, extraction of teeth, swollen jaws or jaw pain. 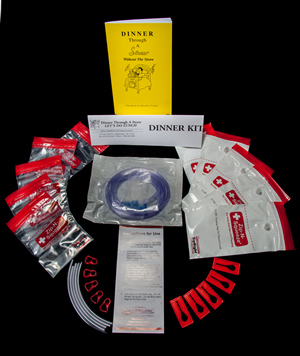 Dinner Through A Straw Pre-Assembled Kits are provided for convenience, cost consciousness and thoroughness in the healing and eating processes. Each kit is unique and geared for specific needs. These kits are often ordered by physicians to give to the patient at surgery or by the patient and family members to promote wellness.